It is a 7-days Trek from Paro to Jumolhari base camp at Jangothang, returning via the same route or by an alternative trail to Paro. The view of Jumolhari Mountain (7314 M) from Jangothang is spectacular. This Trek also offers an excellent opportunity to see Yaks. The Trek is very popular. The highest point is 4115 Meters. The flight into Paro by national carrier, Druk Air, is a befitting introduction to the spectacular beauty of Bhutan . In clear weather, magnificent views of the world’s highest peaks, give way to the lush green Paro valley as you land. Our trek to Shana starts at Drukgyal Dzong following the Paro river and we pass cultivated fields and tiny webpicturesque villages. The forests are alive with numerous birds and brightly coloured butterflies. Overnight stay at camp Shana . Altitude 2,820 m; Distance 14 Km; Time 5 - 6 hours. Overnight in Camp. The trail follows the river through a heavily forested area with a few isolated farmhousess. It narrows and closes in and the trail winds up and down along the drainage. We pass a junction en route, where another path leads north over the Tremo La to Tibet . Camp is in a meadow with a stone shelter. Altitude 3610 m; Distance 21 Km; Time 7 - 8 hours. Overnight stay in Camp. In the morning, after passing a small army post, the trail slowly leaves the forest line and gradually climbs into a beautiful valley, passing Tegethang, a winter home of yak herdsmen. Lunch will be served in one of these huts. Lots of yaks will be seen before we arrive at the Jhomolhari base camp (4,115 m). High mountains overlook the camp and visible nearby, are the ruins of an old fortress used to guard Bhutan against Tibetan invasions. Altitude 4,115 m; Distance 15 Km; Time 5 - 6 hours. Overnight in Camp. 05 Jangothang (Halt): A rest day. 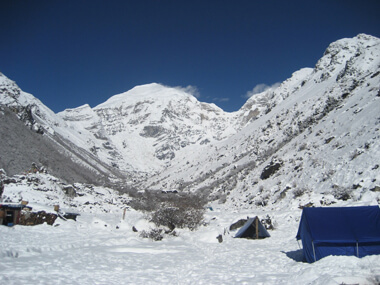 This day is a chance to walk up to the Jhomolhari glacier or to the Tsho Phu lakes on the opposite direction. Overnight stay in Camp. We pass different vegetation and you come across wonderful places for photographs. Overnight stay in Camp. You can pass over many small streams and dense forest. Some time you can see different type’s wild animals. Overnight stay in Camp. Our vehicle will be waiting (at Drukgyal Dzong) to take us to Thimphu, capital of Bhutan . It takes two hours to Thimphu . We take Lunch in Thimphu . In the evening, we drive to Paro. Dinner and Overnight stay in Hotel at paro. Early in the morning, we drive to the airport and farewell.